I must confess that a degree in Zoology was not of use when I came across some new items on this adorable creature. And keeping on with the ongoing theme, here is another Australian marsupial (admittedly, an inhabitant also of Tasmania, Papua, Indonesia, New Guinea and Bismarck Archipelago). Sugar gliders (Petaurus) are gregarious, nocturnal possum/marsupials (i.e babies developing in the marsupium). 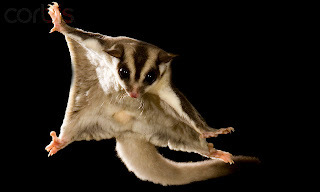 At one glance, one may mistake it for a flying squirrel (Ratufa) due to its webbed patagium which allows it to glide from tree to tree. Their name originates from their predilection towards anything sweet, especially tree saps and nectar, and unsurprisingly, they live in eucalyptus and acacia forests. They are currently in vogue as exotic pets. In parts of Australia, one needs a permit to keep them and Malaysia (which gets its sugar glider population mainly via illegal trade from Indonesia) is considering covering the species under their conservation Acts. Remarkably, their gestation period is only 15-17 days. If only research papers too were! There really are some bizarre creatures in the world, and I couldnt agree more on your last sentence!